Gluten Free Croissants | Great gluten free recipes for every occasion. 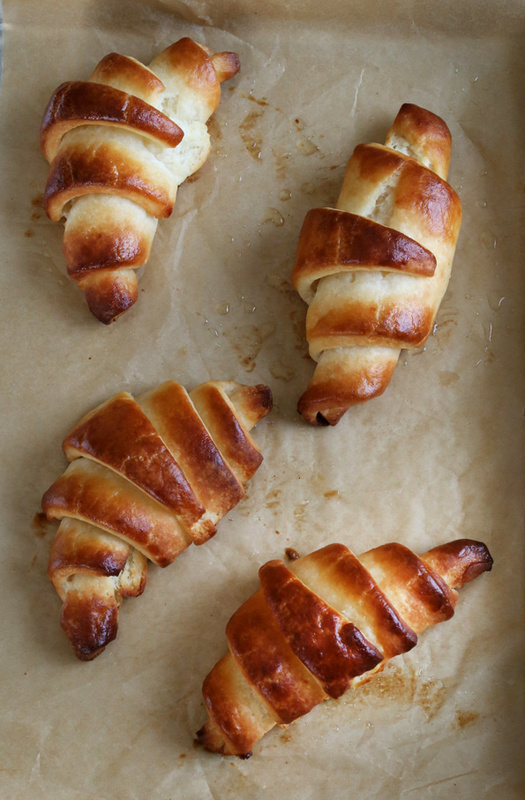 If you have ever wondered if you could make gluten free croissants at home—whether you could really do it—this recipe should settle the issue once and for all. You can do it. You should do it. Here’s how, step by step. These croissants the absolute real Frenchie-style, unbelievably melt-in-your-mouth flaky deal, but they’re actually quite easy to do. Yes—that’s right. I said that traditional, yeasted croissants are easy. The number of step by step photos you see below is not because it’s hard to make these beautiful pastries happen. It’s because I know you might fret over the whole business, so I thought some hand-holding was in order. That’s all! Believe it or not, traditional gluten free croissants are one of the most common recipes requests I have received over all the years of writing this blog. It’s not like it’s every day that I’m positively buried with requests from readers simply dying to make their own croissants, though. It’s more like a steady drip-drip-drip of requests over the years. Over time I’ve mostly pointed readers in the direction of these custard-filled danishes from years ago, since danishes are made from yeasted puff pastry, which is really what croissant dough is. I’ve also suggested to readers that they just use my recipe for gluten free puff pastry (no yeast involved), and call it a day. After all that recipe has plenty of step-by-step photos. Traditional croissants are, indeed, made with what is essentially a yeasted puff pastry dough, making these the most delicate and flaky of pastries as they get lift both from yeast and from “laminated” dough (lamination is simply the process by which you encase layer after layer of cold butter in layer after layer of pastry dough). That’s the only time you’ll hear any “fancy” terms, though, in this whole business. Period full stop. First, make the dough. In a large bowl, place the flour, yeast and sugar, and whisk to combine well. Add the salt, and whisk again to combine. Create a well in the center of the dry ingredients, add the butter and milk, and mix until the dough comes together. Add more flour by the half-teaspoonful if necessary to bring the dough together. Turn out the dough onto a lightly floured surface, sprinkle the top very lightly with more flour, and roll into a 9-inch round. Wrap tightly in plastic wrap and place in the refrigerator to chill while you prepare the butter packet. To prepare the butter packet, sprinkle a piece of unbleached parchment paper with 1/8 cup (2 tablespoons) of the flour, and place all 16 tablespoons (preferably in 2 whole sticks) of butter on top and press together. Sprinkle with the remaining 2 tablespoons of flour, and cover with another piece of unbleached parchment paper. Pound the butter with a rolling pin until it flattens and melds together. Uncover and fold the flattened butter in half, cover again with the parchment and pound again until you have a 5-inch square butter packet. Cover the butter packet completely with parchment, and place in the refrigerator to chill for 5 minutes or until firm. Next, wrap the butter packet in the dough: Remove the 9-inch round dough from the refrigerator, unwrap, and place it on a lightly floured surface. Place the chilled butter packet directly in the center of the dough and score the sides of the dough lightly to represent the exact size of the butter. Remove the butter and set it aside. Using a rolling pin and sprinkling the dough lightly with flour as necessary to prevent it from sticking, begin at the site of each of the four scorings and roll the edges of the dough away from the center to create 4 flaps, leaving the center of the dough intact. Return the butter packet to the intact center of the dough, and wrap the flaps of the dough around the butter packet like you would a present. Roll out the dough with the butter and complete the first “turn.” Sprinkle the dough-and-butter-packet lightly with more flour, and roll out into a 1/2-inch thick rectangle. Fold the rectangle over on itself in thirds, as you would a business letter. Sprinkle the dough again lightly with flour. With the length of the 3-layer rectangle of dough running parallel to your body, roll the dough away from you into rectangle that is again about 1/2-inch thick. Turn the left and right sides of the 1/2-inch thick rectangle over on themselves again, as you would a business letter. You have just completed the first “turn.” Wrap the folded dough tightly in plastic wrap and place in the refrigerator to chill for at least 4 hours or up to overnight. Complete the remaining 4 to 5 “turns.” Once the dough has finished chilling after its first turn, repeat the process of rolling the 3-layer dough out into a 1/2-inch thick rectangle, then refolding the dough like a business letter, at least 4 more times, and for good measure 5 more times, wrapping and chilling the 3-layer rectangle of dough in the refrigerator for at least 30 minutes (or the freezer for 10 minutes) in between turns. Shape and proof the croissants. Line rimmed baking sheets with unbleached parchment paper and set them aside. 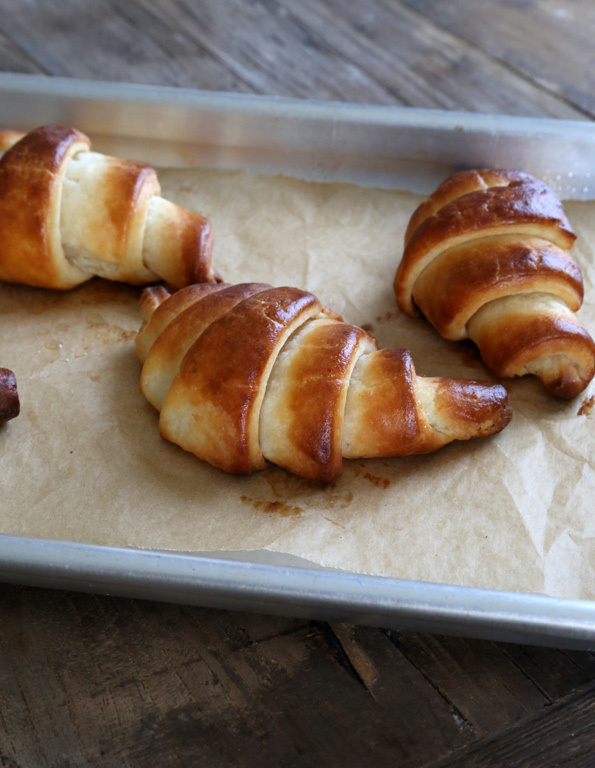 Roll out the prepared 3-layer croissant dough into a 1/4-inch thick rectangle. Using a pastry wheel or pizza wheel (or very sharp knife—well-defined edges are essential here), square the edges, then cut out as many 4-inch x 6-inch rectangles as you can. Slice each rectangle diagonally into two triangles and separate the shapes from one another. Sprinkling lightly with flour as necessary to prevent sticking, roll each triangle out to elongate it to about 8-inches from base to tip. Slice a notch into the base of each triangle about 1/2-inch deep, and roll each triangle into a coil from base to tip, turning the edges slightly away from each other as you roll. Place on the prepared baking sheets, seam side down, about 2-inches apart from one another. Cover lightly with oiled plastic wrap and place in a warm, draft-free location until nearly doubled in size. You will see the individual layers in each fold begin to separate slightly from one another once the croissants are fully proofed. Uncover the baking sheets and brush the tops and sides of the croissants with the egg wash. To avoid glueing the coiled layers of each croissant together, brush with the egg wash by beginning in the center of each pastry and brushing out to the sides in one motion on each side, with the “grain” of each coil, not against. Place the shaped and proofed croissants in the refrigerator to chill for at least 10 minutes or until mostly firm. Bake the croissants. While the shaped croissants are chilling, preheat your oven to 400°F. Place the chilled and proofed croissants in the center of the preheated oven, one baking sheet at a time, and bake for about 15 minutes, or until deep golden brown all over and firm to the touch. Allow to cool briefly before serving. P.S. Which Gluten Free on a Shoestring Cookbooks do you have? Your support keeps the blog growing and the books coming! Hi Nicole, I made these over the weekend and I had some issues with them so I wanted to get some feedback from you. I have made regular Croissants before so I am familiar with the process. I used your recipe for Cup 4 Cup flour and used Bob’s Red Mill White Rice and Brown Rice Flours. The croissants ended up very sandy/crumbly rather than flaky. I used instant yeast and they did not rise at all, so I didn’t get any of the flaky layers. I’d say they ended up more biscuit like in texture. I’m not sure what went wrong and I’d like to give them another shot because yours turned out gorgeous.. Any tips and or feedback would be most appreciated, I love your blog! Thanks so much! The grittiness is from your flours. As I describe on the Gluten Free Flours page, you must use superfine white and brown rice flours. Bob’s Red Mill rice flours are some of the grittiest rice flours you can buy, and are of inconsistent quality, at best. Authentic Foods is the only company that makes superfine rice flours, and I discuss where I talk about what’s in my pantry, here. I’m afraid you simply can’t make a proper gluten free flour blend using Bob’s rice flours. Aha! When I searched online for Superfine Bob’s came up ;). That is good to know!! Do you think this also affected their ability to rise? Thanks so much for the help! What would be the best way to cut the dough to make pain au chocolat? Do these slice well to make sandwiches from the baked croissants? I’m confused about the scoring and rolling away from the center. Just take a look at the second-to-last photo in the step by step photo collage, Cindy. That should illustrate it for you! Is the flour list on first line of recipe. Is that 3 choices to use or use all? Have so many recipes I used to make with croissants dough . My whole family is going to be thrilled. Back when I made your flour recipes I labeled one “Better then Cup4Cup”. Is that the same one I need for this recipe? Thanks for providing this one. if I nail this, I can once again hit the back corner at the big box store and not be sad that I can’t enjoy crossaints anymore. Nicole, this recipe is a Godsend!! Have you tried freezing them? I know when I used to make regular Crossiants I would bake them and then freeze and reheat in a warm oven.. I know that you can freeze them unbaked as well. It would be nice to make a big batch and pop them out during the Holidays.. Thanks so much for posting! Hi, Carrie, I really don’t recommend freezing them unbaked as I strongly recommend against freezing unbaked yeast dough. It can be temperamental, and sometimes the yeast survives and sometimes it doesn’t. You can definitely try freezing them once they are baked and cooled, then defrosting in the refrigerator and warming in a low oven. Can you provide a few pointers for those of us who don’t have a huge chunk of time to devote to making these? Are there do-ahead points, where I can put in fridge and come back later, even the next day? Rhonda, there is a recipe for Quick Puff Pastry in my second book, Quick and Easy. I would go for that recipe. There really isn’t any way to rush traditional croissants, though, I’m afraid. Each active step doesn’t take much time at all. Nicole, this recipe looks fantastic. Do you think it would work with your Dairy-free Pastry Flour Hack for those of us who are dairy-free? I’m thinking of replacing the butter with Earth Balance buttery spread. I use it in place of butter for baking pretty frequently and it always turns out fine. Anne, pastry baking, especially puff pastry and Danish pastry like this, is an entirely different animal. Earth Balance has a very significant amount of water, and it would leak right out of pastry, leaving you with flat, unflaky pastry. I think Donia’s plans to use butter-flavored Spectrum nonhydrogenated vegetable shortening (below) are worth a shot, though. A work of art! Thank you Nicole for posting all the turns! What would you use to replace the dry milk in the flour? I think you found your answer based upon your question above, Anne! I think this will work too Donia. go for it! HILMA!!! tell her I say “HI”. what a wonderful lady!!! Thanks, guys! It would be great to see you both (and Nicole, too!). I’ll tell Hilma you said hi! There are many days when I wish I could bake with you again, Nicole! Good wishes to my mom will be passed along, and she will have a great time helping me make these! She has so much more patience for the steps than I do.